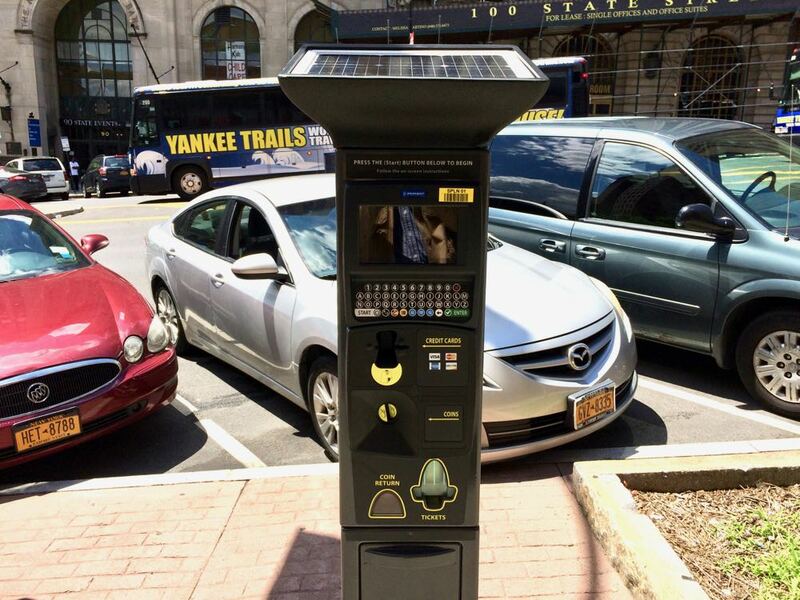 One of the new pay-by-plate meters on State Street last summer. These upgrades to the parking experience will allow visitors and residents the ability to add time to their parking session from their smartphone, and with the pay-by-plate meters, they won't need to return to their car to place a ticket on the dashboard. In addition to paying for parking through the app, Albany residents and visitors can now conveniently monitor their parking sessions, view payment history and receive email receipts. The APA says it will start rolling out the new-style meters in the areas around downtown and the Capitol next week. The multi-space meters in other parts of the city are scheduled to be replaced in July. The authority says the new meters are going to be next to the old meters, so you may see one wrapped-up meter next to another. When the new meters are activated, the old meter will be wrapped and marked for removal. The mobile payment is available via an app for iOS or Android, as well as a mobile website. If you've used the mobile app downtown, you might remember that it's "Zone 100." As the new meters are distributed to other locations, we're guessing there will be new zone numbers -- so that's something to watch for on signs and remember if you're paying that way. Is there any time limit on how long you can stay in a spot? I remember when it started there was, but many feared it was just going to turn into a way to make money without turning over the spots. The technology presents an opportunity to allocate scarce parking resources fairly, among different constituencies, better than the current permit system. For example, in Center Square, you could have free parking for residents, a nominal fee for short term parking, and steeper fees for all-day parkers. The key is pricing it properly. K, if the price is set right, that will encourage turnover. Higher hourly prices will discourage long term parking. Lower prices encourage it. Parking economist Donald Shoup recommends setting the price so about 15% of spaces are empty. That way, new people will have a place to park, the price isn't too harsh, and efficient use is made of a limited public resource. I'm troubled that the new meters are being placed next to the old ones rather than on the same spots. This means that when the old ones are removed, their concrete platforms and mounting holes will remain, marring the sidewalk. This is what happened the last time we got new meters. So now there will be multiple pointless platforms in each spot. This is a historic district, and the Parking Authority needs to be more sensitive to keeping the sidewalks attractive.